The performance of the organ version at St. Burchardi church in Halberstadt, Germany began in 2001 and is scheduled to have a duration of 639 years, ending in 2640. On February 5, 2009, Diane Luchese performed "Organ²/ASLSP" from 8:45 a.m. to 11:41 p.m. in the Harold J. Kaplan Concert Hall at Towson University. This 14-hour-and-56-minute performance, in strict adherence to the score's temporal proportions, is the longest documented performance of the piece by a single person so far, although a full 24-hour performance of the original piece, ASLSP, was given by Joe Drew during the ARTSaha! festival in 2008. Drew has also given 9- and 12-hour performances of the piece, and as of September 2018[update], was planning a 48-hour performance. On September 5, 2012, as part of John Cage Day at the University of Adelaide, Australia, Stephen Whittington performed an 8-hour version of ASLSP on the Elder Hall organ. The eight sections of the work were each allocated an hour, with each section divided into segments of one minute, within which the precise timing of events was left open. In performance, seven sections were performed, with one omitted and one repeated. Organ registrations were determined by chance procedures. A 12-hour performance took place on September 4–5, 2015, in an all-night concert at Christ Church Cathedral in Montréal, Québec. The work was performed by the Cathedral organists Patrick Wedd, Adrian Foster, and Alex Ross, while other Cage compositions were performed simultaneously in the church. The performers used a stopwatch, and the timing of each note was precisely calculated and written into the score. The bellows used for the Halberstadt performance. The organ used for the Halberstadt performance. 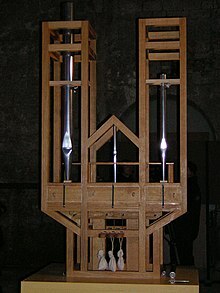 A 1997 conference of musicians and philosophers discussed the implications of Cage's instruction to play the piece "as slow as possible", given that an organ imposes virtually no time limits. A project emerged to perform the piece for 639 years. A properly maintained pipe organ has no specific lifespan; the duration was chosen to commemorate the first documented permanent organ installation, in 1361 in the Halberstadt Cathedral, 639 years before the proposed start date of 2000. An organ built specifically for the performance was completed in 2009. 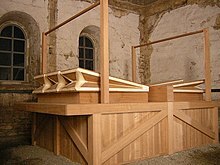 It stands in the right transept of the Burchardi Church, with the bellows in the left. Between January and May 2005, it contained only six pipes. Because the instrument sounds constantly, there is a cube of acrylic glass around it to reduce the volume. The performance commenced in the St. Burchardi church on September 5, 2001, with a pause lasting until February 5, 2003. The first chord was then played until July 5, 2005. The chord consisting of A above middle C, C above middle C and the F♯ above that (A4-C5-F♯5, essentially an F♯dim chord) began sounding on January 5, 2006, and concluded on July 5, 2008. That sonority can be heard on a website devoted to the Halberstadt event. On July 5, 2008, the weights holding down the organ pedals were shifted resulting in the 6th chord change. Two more organ pipes were added alongside the four already installed and the tone became more complex at 15:33 local time. The bellows provides a constant supply of air to keep the pipes playing. The most recent note change occurred on October 5, 2013, and the next change will not occur until 2020. The performance is scheduled to end on September 5, 2640. "ASLSP, Halberstat, Jan 5 2006 note change"
The note change of January 5, 2006 takes place at 8:36 in this audio clip. ^ a b 'World's longest concert' resumes, Steve Rosenberg, BBC News (2008-07-05). Accessed 2008-07-05. ^ "The Towerlight, Fifteen hours at the organ". Media.www.thetowerlight.com. Archived from the original on 2009-02-10. Retrieved 2011-08-30. ^ "Joe Drew's Bio". Analogarts.org. Retrieved 2011-08-30. ^ "Stephen Whittington: Musical Renewal". RealTime. Retrieved 2012-09-27. ^ "News and Events". J.M. Coetzee Centre for Creative Practice. Retrieved 2012-09-27. ^ "John Cage Day, Wednesday 5th September 2012". Retrieved 2012-09-27. ^ "John Cage Day Celebrated in Adelaide with Free Concert in Elder Hall". Herald Sun Newspaper. Retrieved 2012-09-27. ^ First notes for 639-year composition, BBC News (2003-02-05). Accessed 2008-07-05. ^ "Sankt Burchardi Church Organ". atlasobscura.com. Retrieved 20 December 2018. ^ "the Halberstadt event website". John-cage.halberstadt.de. 2004-11-19. Archived from the original on July 22, 2011. Retrieved 2011-08-30. ^ "One Thousand Hear Change of Note in World's Longest Concert". Deutsche Welle. Deutsche Presse-Agentur. 5 July 2008. Retrieved 2011-08-30. ^ Wakin, Daniel J. (6 May 2006). "John Cage's Long Music Composition in Germany Changes a Note". The New York Times. Retrieved 2011-06-25. ^ "So Begins the Hiatus (Organ2/ASLSP in Halberstadt)". John Cage Trust. 18 October 2013. Retrieved 2013-11-11. 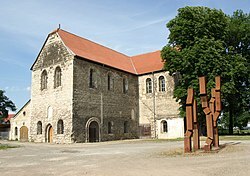 I'm just back from Halberstadt (a 20+ hour journey), having attended the ceremonious 13th note change in the hyperdurational sounding of John Cage's Organ2/ASLSP. This is the last note change to occur for seven long years, so it was particularly well attended. ^ "Schedule of Sound Changes". World's longest concert will last 639 years The Washington Post. November 21, 2011. This page was last edited on 29 March 2019, at 03:52 (UTC).